With Rogue One coming out in less than a week I, like many Star Wars fans, am excited to see Darth Vader on the big screen again. How will Darth Vader’s appearance in Rogue One add to his legend? And will it help explain more about him being a vergence of the Force? I’m hoping so, because as we have seen so far, Darth Vader is the perfect vergence in the Star Wars galaxy. A vergence in the Force was first mentioned in The Phantom Menace by Qui-Gon Jinn when he told the Jedi Council that he had encountered a vergence in the Force that centered around a boy (Anakin Skywalker). Vergence comes from the German word vergenz which means overturn. A vergence is defined as a simultaneous movement of the pupils of the eyes toward or away from one another during focusing, and as the direction in which a fold is inclined or overturned. And as we review Anakin Skywalker’s life we can see that it does converge from his birth and death to one specific point, when he became Darth Vader. And Anakin overturned the Jedi and Sith at different times in his life. As a young boy in The Phantom Menace, Anakin Skywalker is very selfless and kind towards others. At nine years old, he willingly offers to help Qui-Gon, Padme, and the others in their group by offering to enter the dangerous Boonta Eve Classic podrace in order to allow them to be able to fix their broken ship. Ten years later, in Attack of the Clones, Anakin is still concerned for others (his mother and Padme come to mind), but it is in more of a selfish way, and with his slaughtering of the Tusken Raiders he begins teetering on the Dark Side. And at the midpoint of his life, at 22 years old in Revenge of the Sith, Anakin completes his turn to the Dark Side by becoming Sith Lord Darth Vader. At this point in Anakin Skywalker’s life he had spent his first 22-plus years on the Light Side of the Force, looking to help, serve, and save others. But beginning with cutting off Mace Windu’s hand and allowing Palpatine to kill Mace, followed by killing many Jedi younglings, and then contributing to his wife’s death (and he thought to his unborn child’s death), Anakin experienced what was most likely the darkest and worst time in his life. This is nearly the exact midpoint in Anakin’s life; the vergence of his life. He then begins his plodding path to redemption. In Return of the Jedi, Vader is nearing the end of his life and is caught directly between Luke Skywalker, his compassionate son, and Emperor Palpatine, his sadistic master. It is a vergence of his loyalties and emotions. At one end is his love for his son and his rekindled desire to do what is right. At the other is his lingering passion to control and defeat others and his nearly unbreakable connection to Palpatine. He can see his son trying to selflessly save him, and he can see Palpatine trying to manipulate him into killing or being killed by his son. At the end of ROTJ he chooses to save Luke and to return to the Light Side of the Force, completing his return to the Jedi. Anakin is 45 years old at his death, and dies as a vergence of man and machine. He spent his first 22-plus years as a Jedi and the next 22-plus as a Sith Lord. Nearly half of his life is spent doing good works and the other half, evil deeds. From his birth he slowly got closer to the Dark Side until he became Darth Vader. From that point he slowly turned back the Light Side until he once again became Anakin Skywalker. So was Anakin neutral like the Force? He seemed to be. As Anakin he wasn’t all good and as Vader he wasn’t all bad. He fought for and against both sides of the Force, probably more than anyone else in Star Wars. He was the balance in the Force. Rogue One will be the seventh live-action Star Wars film in which Anakin/Vader is alive on-screen, and it will be the middle film of those seven. Another Vader vergence. I can’t wait to see Rogue One and I can’t wait to see the Vader reveal on the screen. We know we’re going to see him, but when and how he is revealed remains to be seen. Thanks for reading my blog. 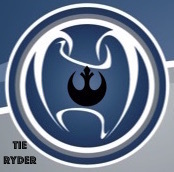 Thanks to my Idiot’s Array podcast co-hosts Alan Zaugg and Mark Sutter for helping inspire this blog and for the great discussion on episode 35 of vergences in Star Wars. Interesting perspective with the word “vergence.” We will see on Thursday the 15th! Very interesting, Ryder. I never really thought about this “vergence” of which Qui-Gon spoke, but it certainly makes one ponder the idea — especially given your points. How about this definition of vergence: “a measure of the convergence or divergence of a pair of light rays, defined as the reciprocal of the distance between a point of reference and the point at which the rays intersect.” Very, very similar to your (more referred to definition), but possibly a bit clearer when thinking about Anakin’s/Darth Vader’s life? There definitely were well-defined moments in both characters’ (yes, they were the same person … but very different images of the same individual) lives, and if you think about Anakin being one light ray, and Darth Vader the other, the intersections are pivotal moments in both Anakin’s and Darth Vader’s lives. A bit of a tangent… 9-year-old Anakin was a sweet, selfless boy, true, but he was not the angel that everyone thought him to be. Even at that tender age, he had a dark side. True, it may not have surfaced very often, but it was there. At 9, young Anakin was very quick to anger. (I hope I have the placement of this scene correct; I am going on memory, and it’s been a long time since I’ve watched TPM. 😉 ) Qui-Gon Jinn and Watto have just concluded their haggling over the entry fee for the Boonta Eve Classic podrace. The revered Jedi has departed, and Watto makes a snide comment about Qui-Gon. It’s brief, but take a gander at the look on Anakin’s face. The boy crosses his arms across his chest, draws his brows together in a deep furrow, and has a distinct angry look on his visage. The signs were always there that he was an individual who could not control his emotions. I ask you this — was it Anakin/Darth Vader who truly was the individual who brought balance to the Force? In the two key moments in Anakin’s/Darth Vader’s lives (when he turned to the Dark Side, and then when he was brought back to the Light Side), it took another individual to push Anakin/Darth Vader over the edge (Palpatine and Luke, respectively). If that is the case, how could he actually be the one who brought balance to the Force? I really enjoyed your blog! Thank you so much!